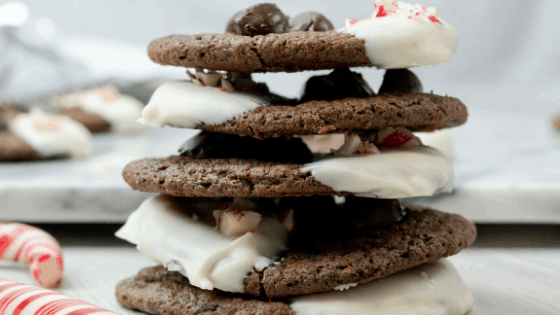 These Peppermint Patty Chocolate Cookies are made using peppermint patty pieces, dipping white chocolate, and crushed peppermint candy canes. Peppermint is one of the top flavors of the Holiday season. When I created this cookie I wanted it to not only taste delicious but to look festive as well! One side of the cookie I put halved mini peppermint patties and on the other side, I dipped it in white chocolate and sprinkled crushed peppermint candy canes on the white chocolate. I didn’t really think it was going on come out as delicious as it looked! These cookies would work great as a gift during the holidays! They would easily fit inside small treat bags and be tied off with a red and white ribbon. The flavors in this cookie would also be great for Christmas parties, or even just for a cozy night in with the kids. It’s a cookie everyone can enjoy. After making this cookie and adding the peppermint patty pieces, it’s important to let this cookie cool completely before moving on to adding the white chocolate. If you do not wait until the cookie is completely cool and set, it will fall apart and your cookies will be ruined. I test the cookies by picking them up and checking to see if they still bend. If they don’t bend and start to tear, you’re ready for the dipping process. After dipping these cookies in the melted white chocolate, sprinkle the crushed candy canes on the cookie and let cool. TIP: It’s a good idea to dip the cookies one at a time to ensure the crushed candy canes will stick to the cookies. I love this cookie idea and can’t wait to make them! I can imagine how wonderful these flavors taste together, they are sure to be a huge hit with the family! Thanks for sharing the recipe. These are just perfect for the holidays! Love the peppermint on the outside. Love the flavors and they look so festive for the holidays with the white chocolate dip. Great recipe! These cookies look fun to make! Love that they can be turned into a Christmas gift!